Finally, I've recovered a bit from the computer crash. I still have a long list of software in need of installation, such as the Eye Fi card that I love so much, which sends my photos to the computer by wireless, and the HTML editor and ftp uploader for my website. Photoshop 6 doesn't seem to install on my 64 bit Vista machine, so while DH researches that issue (supposedly solvable), I'm learning Photoshop Elements. It seems to have everything I use; it's just a bit different. Big sigh. The last couple of weeks have just been filled with trials. I successfully unloaded my 1" belt sander and used it to rough shape the faux bone for my stilt rivet brooch. After what seemed a long time with first a file and then many grades of wet sandpaper, I had the piece ready to carve. 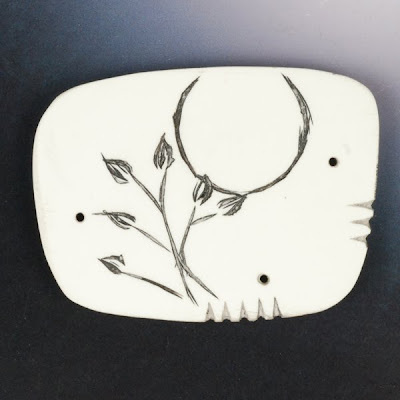 The front carving of the moon and branches, with Dockyard microcarvers was easy. I tried various bits in my flex shaft on a scrap of faux bone, until I could carve my bird and branch motif to my satisfaction. Of course, when I went to do this on the real piece of faux bone, the bit seemed dull and dug ugly tracks randomly along my nice lines. Another big sigh. Finally last night, I mustered courage, stopped procrastinating, and returned to the belt sander and handwork, removing all the scuzzy carving. An hour later, I went to bed happy that I was ready to engrave today. A bit more sanding in the light removed the scratches I couldn't see last night, and then my new Dremel engraver made the work of drawing my design extremely easy. A bit of paint in the low spots, and more sanding to remove paint on the high spots, and now I see the extra details that I want to clean up and add. Back to work! Yeah! No more big sighs! P.S. 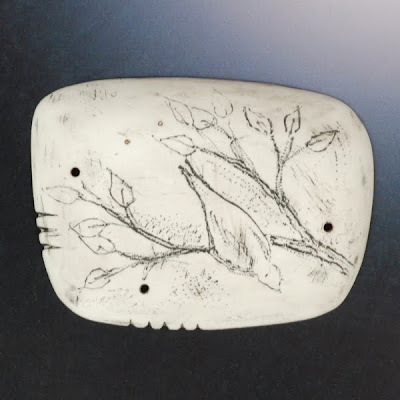 This faux bone piece goes underneath a silver clay piece shown here and in these sketches. Beautiful work! I got to your blog from Judy Perez! I'll be back to view your work!! Thanks!